During the fall season of 2013, we collected daily HRV, perceived wellness, training load and performance (race times) from a collegiate cross country runner. We wrote this up as a case study and it was published this month in JASC. Endurance performance relates to resting heart rate and its variability: A case study of a collegiate male cross-country athlete. This post is a brief summary of our findings. This athlete competed in 8 km races on Saturday’s throughout the 8 week competitive season for a total of 6 races. HRV data was collected daily with ithlete in a seated position after waking and elimination. Daily wellness questionnaires were delivered to the athletes e-mail via SurveyMonkey (thanks to Carl Valle for this idea) which asked the subject to rate his perceived sleep quality, muscle soreness, fatigue, mood and stress levels out of 5 for a total wellness score /25. Training sessions were quantified with sRPE and a basic TRIMP value. Race times were collected from the host University’s official final results. Resting heart rate and HRV derived from the smartphone measures were averaged weekly. In addition the coefficient of variation (CV) was calculated for all weekly HR measures. *Note: lnRMSSD (i.e., HRV) is modified by the application (lnRMSSDx20) which is how the data is presented. Our initial hypothesis was that the weekly mean of HRV would relate best to performance (8 km races) and that HRV would be a more sensitive measure than basic RHR. However, we found a near perfect correlation between the CV of HRV and performance (r = 0.92). When the CV was high for a given week, performance was worse (slower 8 km race time) whereas when the CV was lower, performance was better. A very similar, but slightly weaker correlation was found with the CV of resting heart rate. 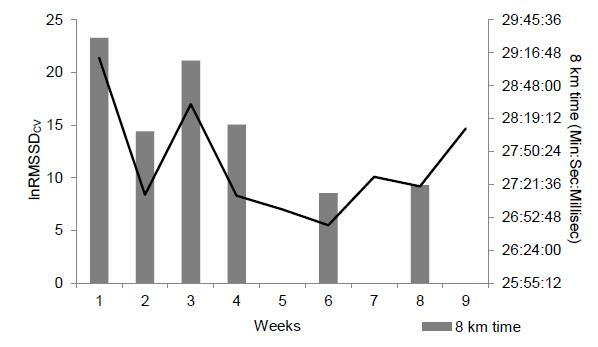 The figure below represents the relationship between weekly HRVcv and 8 km race times. It has been suggested that as a result of tapering and the associated decrease in lnRMSSDmean, the relationship between lnRMSSDmean and performance is reversed (1). This may explain our finding of only a moderate correlation between lnRMSSDmean and 8 km race time and indicates that associations between endurance performance and lnRMSSDmean must be assessed within the context of the training phase and period (1). The CV reflects the fluctuation in a metric (i.e., HRV/HR in this case) across the week. It’s been suggested that this marker represents the fatigue (decrease in HRV) and recovery process (return toward baseline). However, we also know that non-training related stressors may also effect daily changes. Therefore, a week with higher CV likely represents higher overall stress whereas a decrease in CV might indicate lower stress and/or better recovery, etc. This however should be taken into context with other indications of training status (e.g., TL, wellness, etc.) as a decreased CV has previously been associated with non-functional overreaching in an elite female triathlete in a case study by Daniel Plews and colleagues. HRmean and lnRMSSDmean measures were similar on both occasions this season (lnRMSSDmean 73.8, HRmean 70.1 in week 3, lnRMSSDmean 72.6, HRmean 70.5 in week 8), however lnRMSSDcv and HRcv values in week 8 were nearly half of the values in week 3 (lnRMSSDcv 17, HRcv 12.7 in week 3, lnRMSSDcv 9.2, HRcv 6.5 in week 8). Most importantly, race time was 1:49 (min:sec) faster in week 8. Obviously, as this was only a case study of a single athlete across a single season, our results need to be interpreted with caution. However, if you’re monitoring HRV in yourself or of athletes, it would likely be best to include the CV in addition to the weekly mean when evaluating training status. Looking ahead, we have 2 new manuscripts in review right now that evaluate the mean and CV of smartphone-derived HRV in a team of collegiate female soccer players as we make associations with training load changes and performance adaptations. These are very practical papers and the first, to my knowledge, that utilize smartphone applications with ultra-short measures (~1 min) for athlete monitoring. This entry was posted in Heart Rate Variability, Monitoring and tagged Case Study, endurance, heart rate variability, HRV, performance. Bookmark the permalink.